That Time I Met The Doctor And A Hobbit. The ultimate birthday achievement was unlocked a couple of days ago: I went to a fun pop culture convention and got to meet two awesome dudes. One starred in a series of films that means the absolute world to me, and the other is one of the most ridiculously good looking men on the planet. Sean Astin and David Tennant. The Lord of the Rings trilogy is beyond perfect to me. Sean’s portrayal of Samwise Gamgee moves me to tears every time I watch it. David is not only a super Hottie Mchottieson, he’s also a super Actor McActorson. But dear to my heart are his roles as Barty Crouch, Jr. In Harry Potter And The Goblet Of Fire and The 10th Doctor. A few weeks ago, I found out these guys were appearing at the Raleigh Wizard World Convention the day before my birthday. And lucky me, I have the sweetest boyfriend ever – he got me photo op tickets. ROAD TRIP!!!!! Raleigh is only three hours away from my house, so we hopped in the car first thing in the morning and despite the constant drizzling, got there with no problems. Everything about the con was efficient, friendly, and smooth. Which is great for someone like me, who can get a tad overwhelmed in crowded situations. Big ups to Wizard World! We started our experience, just wandering around the main floor. There were tons of vendors, of course. I was surrounded by so much geeky goodness, I got overwhelmed and didn’t buy anything. HUH? Yeah, I know. Weird. Wait, this isn’t entirely true. I did buy myself a brew to calm my nerves before meeting the famous dudes. 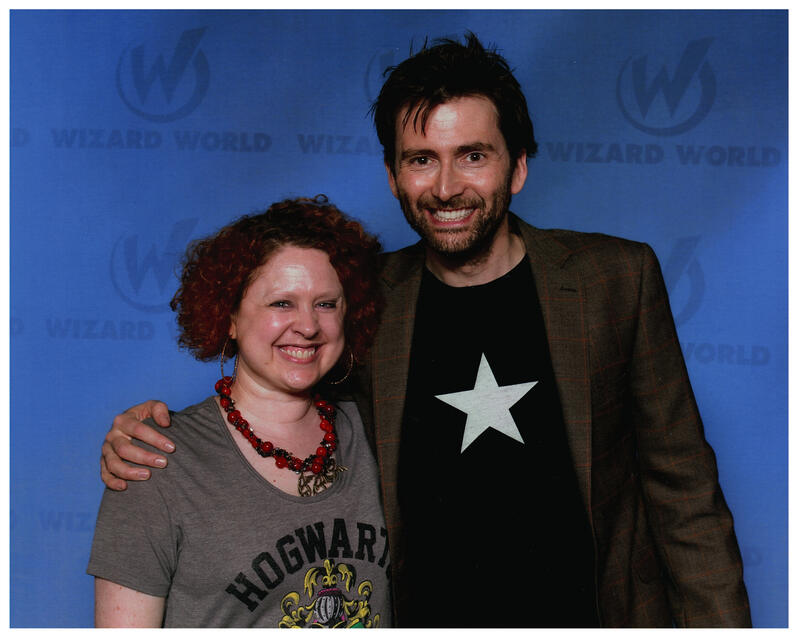 Speaking of famous dudes, when Tennant walked onto the floor for his autograph session, the place ERUPTED. That got me amped up for sure. However, since that wasn’t happening for a few hours, we continued to meander around. Not only were there vendors on the floor, there were some educational booths set up. 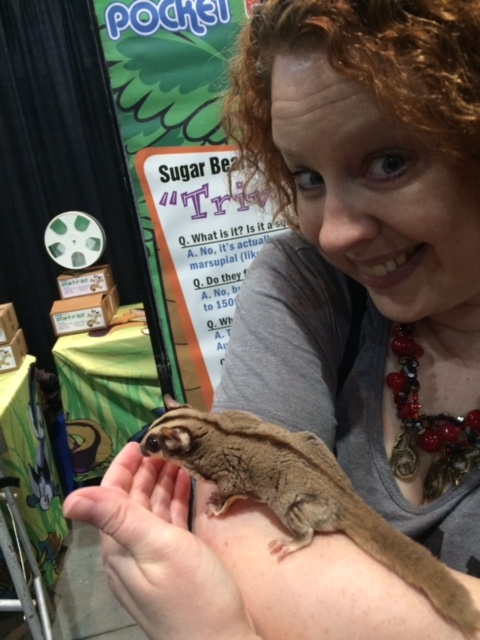 I made a friend at the Sugar Bears booth! It was so precious! I also grabbed some info on the Sea Shepherd Conservation Society. I plan on doing something for them soon. Finally, we enjoyed watching all the cosplayers (and dorks like me, just showing off our nerd pride with t-shirts). 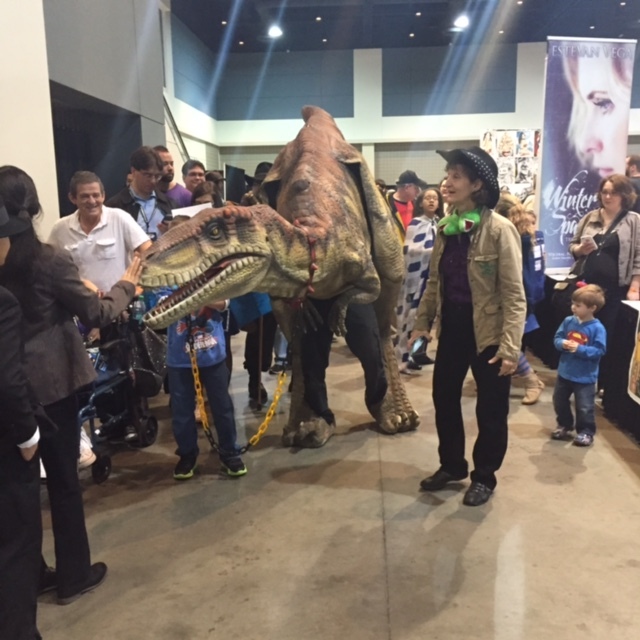 Especially this DINOSAUR! He went right up and tried to bite my dude – what nerve! 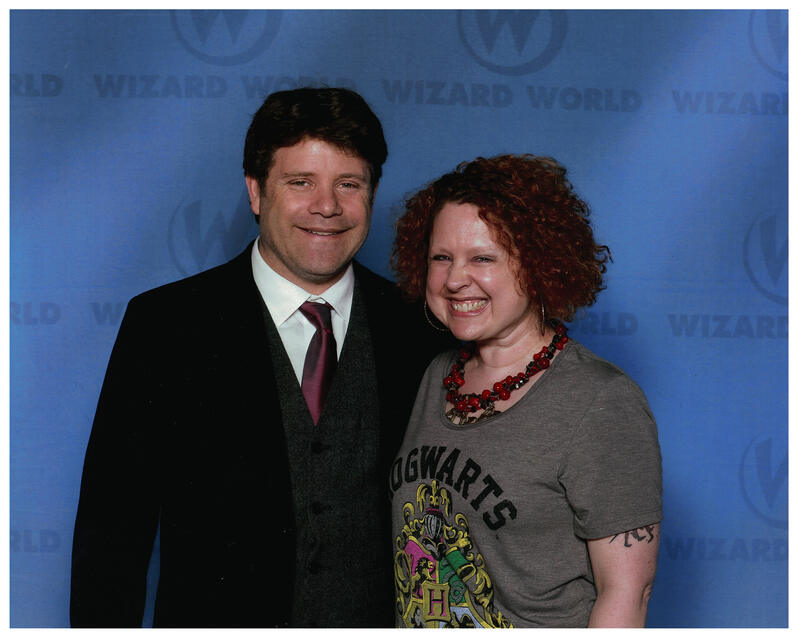 After wolfing down some french fries, we were ready to stand in line for the Sean Astin photo op. It went very quickly. Before I could even mentally prepare, there was Frodo Baggins’ gardener/bodyguard/protector/hero right in front of me. And boy, was he dressed nice! This caused me to forget to thank him for being a part of my all time favorite movie series. Instead I just complimented his clothes. Me = lame. However, he was extremely gracious. Squee #1! Squee #2 came not long after. We made one more round of checking out the stuff on the main floor (and purchasing another beer for my nerves), and caught a bit of David Tennant’s Q&A panel on the big screen, before queuing up for his photo op. THERE WERE SO MANY PEOPLE! It was not surprising, but astounding all the same. I’m sure his face ached afterwards. We were given three rules before we entered the photo area: No hugging, no posing, and only fist bumps. I was a tad distressed since I planned on asking to do the back-to-back Rose/Ten pose. Oh well. I would behave and do the typical stand and smile pose. Who cares, really, because I’m sharing oxygen with the guy. AND THERE HE WAS. Jeans, cool t-shirt, and blazer. And scruff. I did my best not to hyperventilate. I gave my best cheesy grin and said “HIIIIIII!!!! !” and he returned my greeting with that amazing high Scottish accented voice. Our arms went around each other and click. Done. I said “THANK YOU!! !” and he once again returned my words as enthusiastically. Amazing. My hand lingered for an extra second on his back and then I was out of there. Two Slytherins, being awesome! Squee times infinity!!! It was late afternoon by the time the photo session was over, but we wanted to experience one more thing in Raleigh before heading home. We decided to walk around the corner to a vegan restaurant suggested by our magic iPhone, The Fiction Kitchen. I have to say, that was the most delicious vegan food I’ve ever put in my mouth-hole. 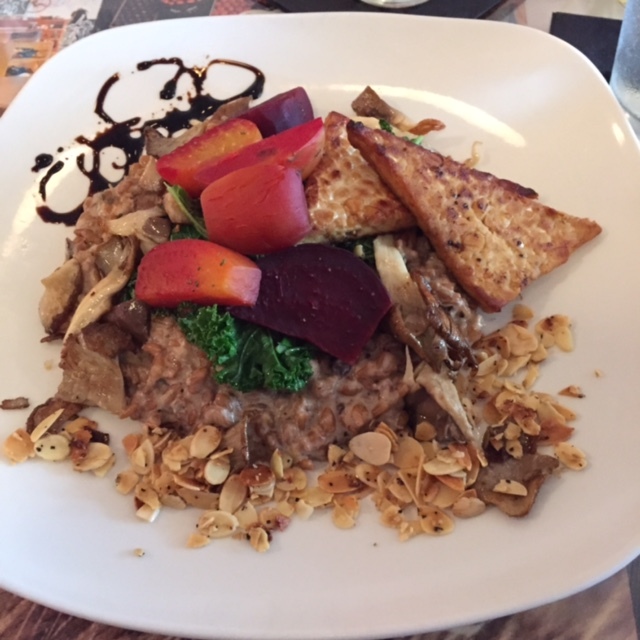 I had the mushroom farro risotto, with added seared tempeh. AMAZING. 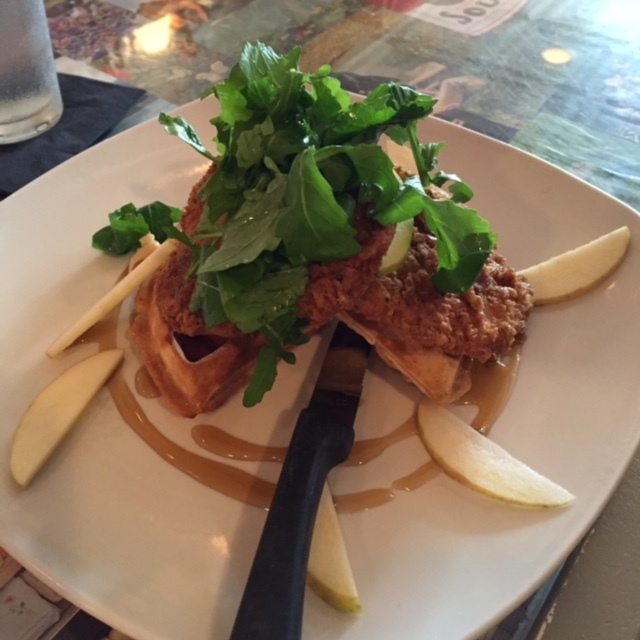 My dude had the crispy fried “chicken” and waffles – I tried a bite and WOW. All of the taste, without hurting a bird! After being filled with yummy goodness, we hopped in the car and headed home. What a fantastic day. I love being a geek. I love my boyfriend. I love my fellow geeks. 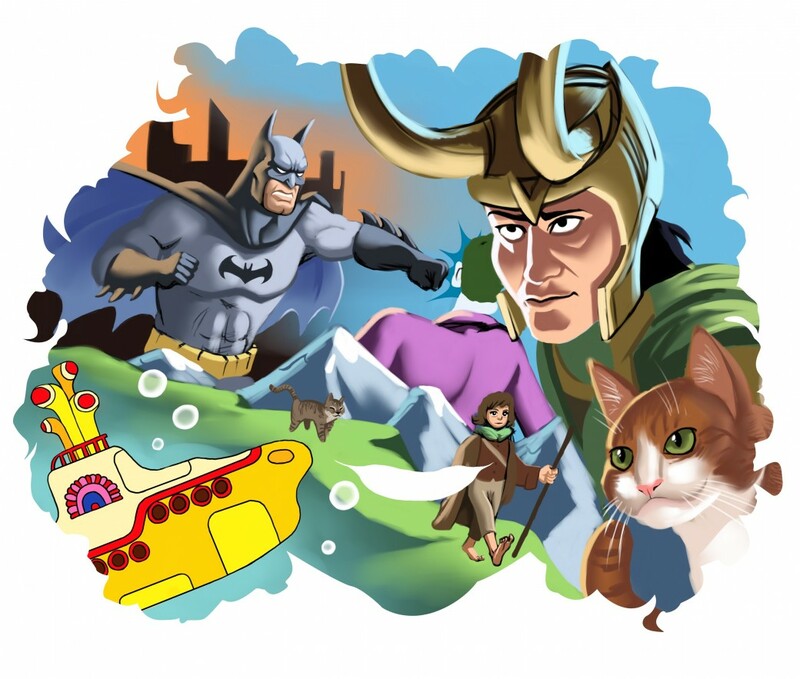 I love Lord of the Rings and Doctor Who and Harry Potter. I love food. I love beer. I love you.